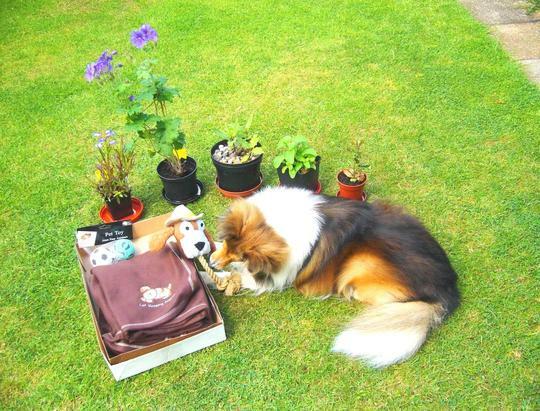 My "Head Gardener", Conker the Sheltie, having fun opening a gift box. Conker had fun finding all the doggie items in this box kindly sent to him by Sueb. He chose the soft toy dog first, because it has a squeaky in it, but he likes the brown blanket too. He says Truffle the puppy can have a turn playing with the toys. In the background are plants sent to me by GoY members over recent months ~ all doing well. Left to right ~ Penstemon from Arlene, Hardy Geranium from Inverglen, Daisy Bush from Islander, Curly Grass from seeds sent by Sal1914 which turned into a Petunia. Lol., and Chaenomeles from Amy. Lol. Truffle was in the dog-run alongside, and he was actually very well-behaved. I think he understands that Conker needs to have a bit of extra tlc right now. Awww, that's lovely to see Terra. What a lovely gift ..a lovely idea and nice to see Conker getting a lot of pleasure from it . Abosoluty wonderful..TT great pic, you never walk alone ,got a lot of friends thinking about you..great to see Conker active. It's nice to see Conker enjoying himself TT. Thank you Angie and Hywel. So far, Conker is doing better than expected. I don't think you'll lose the Corydalis TT once its in your garden it usually stays...:o) Ive been pulling lots out this afternoon! Yes, kind of Sueb to send Conker and Truffle such lovely items. She sent me some chocolate, but the dogs didn't get to see that. Lol. ~lovely to see Conker with his new toy~best wishes for an easy week for him. ~yes mine are too TT~lovely blue/purple! It's so good to see Conker doing so well - he's been in the thoughts of so many of us. Hope you're looking after yourself as well. Here's hoping everything continues to go well. It's wonderful to see Conker a little better. I,m so glad that he managed to show interest in the lovely gifts that Sueb sent. Enjoy your chocolate and good luck to both you and Conker during the next phase of his treatment. TT, Have you ever noticed that special people have special friends...You are a very special person and Sueb is a wonderful friend. Sueb, how thoughtful of you to send Conker this gift. I'm touched by this. Hope your brave boy didn't mind his blood test too much this morning and that the improvement continues apace. Hugs all round. Weeds / Gilli ~ Yes, Sueb was very kind sending the parcel. Conker and Truffle love the toys and blanket. Thank you. I'm pleased you like this picture. Blood test is over awaiting results. Oh its nice to see Conker with his present.....how kind for Sueb to send it to him . Pat him on the head and give him a big hug for being a good boy during the blood tests - when will you know the results? Will they be making adjustments to his treatments per the results of the blood test TT? Good news is that Conker's results were okay, so I gave him the chemo at lunchtime. Good....means he is taking it well...good to hear..
~good to hear that his results are okay~he is a brave little soul and deserves lots of attention which I know you will give him! Good news then TT. May it continue to be so. Have lots of fun, Conker. Glad to see you're feeling a bit better! I'm hoping Conker won't have any adverse side effects to the chemo tablets. Fortunately it is only once a month I'm required to give him those larger capsules. All the tablets are dangerous drugs, so I have to put them at the back of his mouth while wearing plastic gloves, as I do for the other daily corticosteroids. The remainder of Conker's chemo is given intravenously. We will look forward to the bounce TT. So good to see a photo of Conker enjoying his parcel. What a lovely thought. Hope you all have a good nights rest. God bless. Thank you. To keep Conker healthy on his medication, it is vital for him to have lots of water... lots... and lots ..... and lots...and lots..... so I get up to let him out into the dog run several times each night, and to give him extra water. Conker is extremely tired this morning, but doing well. He's doing well - great news! Lovely present, too. :-) Well done, Sueb. Awwwww, how lovely is that? lol. Good to see that Conker is well enough to enjoy the nice stuff sent to you by Sueb. I'm sure Truffle will make sure they have a few tussles over them! Thanks everyone. I'm pleased you like the photo. Lovely photo TT, Conker looks quite happy working on the present, what a lovely thought by Sueb to send him the parcel. Hope Conker keeps up his progress. Hi Terra - Lovely to see Conker with his presents and the gifts members have sent you. It set me to thinking if I could do anything myself. Now I remember last year after I did a blog on the hills here at your request you asked me to do another blog on springtime. Well spring time is nearly over so if you want I will start another blog. Now I could do the hills here again or Bodnant Gardens - both are in the Conwy valley. What would you like? Thinking of you and Conker from Stephan. What a great idea. Any blogs with lots of hillsides please would be lovely. Conker will be back at the clinic next Monday for more chemo intravenously. So I'll start a new blog for Conker soon. I realise Cat's computer explodes if we go very much over 300 comments. Lol. Keep your chin up TT. Great to know that Conker is showing interest in his food. Showing interest in his toys as well that is a bonus. Your positive messages help to keep us going here. It'll be the Chemo that saps his energy TT. I know people that had chemotherapy and they were very tired during there therapy and especially a day or two after they had had it. I'm pleased to say I still drink with a friend who had it a few years ago. Thanks for all the encouraging comments. Makes sense that the chemo would cause such tiredness. Glad to hear that your friend is coping so well and enjoying life, some years after the chemotherapy treatment. It was quite a while ago, infact so long ago that I can't recall exactly when. As far as he is concerned he is cured as he no longer has to go for checkups. Fantastic, both you and him deserve lots of happy years together. Glad to have an update on Conker and such an encouraging one too. Great that his appetite has improved and that he is showing interest in toys etc. too. Thinking of you all. What a team! Glad you're not quite so tired, I know what I'm like after one bad night. Tou're showing superhuman strength, mental and physical. Conker is such a well-behaved patient, that it's a pleasure caring for him. Fantastic, what a gorgeous dog Conker is and he looks so happy. Your doing a great job well done all your love and care is paying off. How lovely to see Conker feeling well enough and interested enough to open a parcel. Pleased to hear he is doing well TT, your care and devotion paying off, and I'm sure he's 'rallying himself' as he knows just how much you care and are trying to help him. Mid afternoon it turned chilly out there so I brought Conker back indoors. However I did lots and lots of pruning....lots and lots....if anything stayed still too long, I pruned it...clematis etc. Lol. ... Truffle the puppy decided to keep on the move... didn't want a haircut with the pruners... lol. It is so good that Conker is up to getting out and trying to play..and it is good for him to rest too...glad Truffle came back in with his tail still in tact...he did good to stay clear...lol..
definitely not for the dogs. Lol. Truffle being a Smooth Fox Terrier, he has the least hair of any dog I've ever owned. There's not really much to trim off. Lol. Are they allowed doggy choc treats? ~having had quite a lot of experience of our vets lately I find it amazing how keen they are to see these people who do horrible things to them~all the tail wagging and licking indicates our animals know why they are there and what you are doing for them~my two have decided they quite like Benylin pedaetric prescribed for a bit of kennel cough! My dogs aren't allowed chocolates made for humans, because, as most people know, these contain theobromine which is very toxic to dogs. I don't even allow chocs made especially for dogs, because I wonder if they cause skin problems. One of the many possible side effects of Conker's chemo treatment is skin infection. Conker's very favourites are Pedigree milky biscuits. I think he would eat a whole boxful if he had the chance. Lol. Glad to know that Conker seems to be doing well~Merlin is a lot better although the lump in his paw still needs to be looked into.Today we went for a walk with no dogs because neither of them would have been comfortable after the first 100 yards~not easy having two invalids!We are losing so much fitness! look after yourself and your boys! I think you are right, Tt, to avoid even doggy chocs. Lucky managed to get stuck into a 250gm bar of Cadbury's dairy milk recently (not here at home). He was very sick not long after, apparently - no wonder, I might have felt same! Theobroma cacao - Latin name for the cacao tree. Sorry to hear of your two companions problems Arlene. I wish them a speedy recovery. Conker is just keeping an eye on you TT. Making sure you make a good job in the garden as he knows that he will have to make good any mistakes that you make when he is a little better. I'm sure he will and then you'll need to look out! I think you are right to steer clear of what they call dog-chocolate, Tt. I have never given Henry any of them. I think that if he got the taste for them. he might try to eat any human chocolate that came his way! He is just SOOOO greedy! He did grab a chocolate tree ornament off my daughter's Christmas tree one year - silver paper and all - she hadn't realised the danger - she knows now! ...and far back on the kitchen benches, too! He could get almost to the back of them if he did decide to! I really think that vets should give out leaflets with common human foods that are dangerous for dogs (and cats)...I've had to tell friends about grapes and raisins, for example! A few years ago The British Veterinary Association put together a leaflet called Pets and Poisons. I gave input on this original design. It has since been updated and is also available on line. Not all toxic items are mentioned... there are hundreds.. but the leaflet has good reminders such as onions, blu-tack, wax candles..... and lots of plants are listed ! ...so could you please post the website/link, Tt?? Thanks! I think this one will enable you to download the leaflet. My dog Phoebe absolutely loves avocado's and now I have heard that they are bad for dogs..I have never given her a whole one but she used to skim the meat out of the skin, she never did eat the skin of it though.. I never knew raisins and grapes were bad for animals, or avacados either. You learn something new everyday!!! Artificial sweeteners can be very toxic to dogs, such as in chewing gum. And, of course, it is advised to keep dogs away from lots of garden items such as bulbs and slug pellets. Conker will receive more chemo after his check up at the vet clinic today. I'll write an update this evening on my latest blog # 19. Update on Conker's veterinary clinic visit today is now on my latest blog. Wonderful, it gives me a lump in my throat, there are so many lovely people around supporting you and Conker, I am so glad I joined this Group. So sorry to hear Conkers is ill TT. I know he is in the best of hands and that you will give him the best of everything in his time of need. Sueb's gift was so touching, glad to see you're surrounded by so many friends !